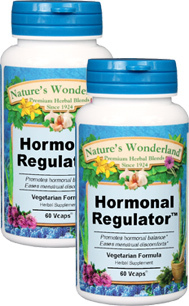 Hormonal Regulator™- 525 mg, 60 Vcaps™ each (Nature's Wonderland) - Penn Herb Co. Ltd.
Banish PMS Mood Swings, Irritable And Discomforts! Hormonal Regulator™ Is The Natural Solution To The PMS Puzzle. The comforting herbal blend relieves irritability and mild mood changes associated with your menstrual cycle and restore a feeling of well-being. WILD YAM, PLEURISY…natural antispasmodic properties help to ease cramps. ALETRIS…female tonic soothes menstrual discomforts. FALSE UNICORN & SARSAPARILLA…hormonal balancing botanicals, which support the female reproductive system. ALFALFA…revitalizing green food rich in Calcium, Magnesium, and other tonic nutrients.